A signature cheap hotel on the Strip is changing its name. It was announced yesterday by Caesars Entertainment that the Imperial Palace would be changing its name to ... wait for it ... The Quad Resort & Casino! That's right. The Imperial Palace will soon be The Quad. Renovations are already taking place on the casino floor and the valet/drive-through hotel entry, and Harrah's official Las Vegas Blog says that the hotel will remain open through the renovations. Vegas Chatter is reporting via Caesars that the official changeover to The Quad will be completed by December 21st. However, renovations will stretch deep into 2013, though you can kiss the "Imperial" goodbye before 2012 ends. Now, the big question is what effect the renovations and upgrades - which are set to include a new nightclub and gift shop - will have on the Imperial Palace's notoriously-low room rates. Currently, the Imperial appeals to the ultra-moderate budget crowds visiting Las Vegas, and their room rates are consistently some of the cheapest on the Strip. That being said, just about every corner of the casino could use an upgrade and, while each room comes equipped with a balcony, it was no secret that the living quarters could use an upgrade, too. Naturally, The Quad will include a pathway to The Linq and is just another piece to the total reimagining of the center-Strip locale that once included an old favorite of ours, O'Sheas. Also, this is actually the second time this particular property has changed its name; the Flamingo Capri opened in 1959 and 20 years later changed its name to the Imperial Palace we've come to know and, well, at the very least become familiar with. It was only in 2005 that Harrah's/Caesars purchased the property, perhaps with their sights already sent on the now-underway Linq Project. So, Cheapos - what do you think about the name change? 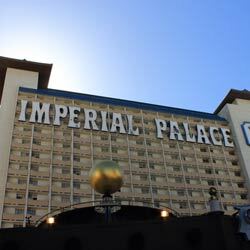 Will you miss the Imperial Palace, or do you say "Good Riddance"? Let us know what you think in the comments section below, or drop us a line ... errr ... comment on Twitter, Facebook or Google+! Submitted by Anonymous on 9/18/12. bad names are bad names. the quad sounds more generic than imperial palace. given i don't stay on the strip anymore, i don't care what happens to the room rates there. and its renovation as part of the linq doesn't excite me. i have little interest in the linq. sorry, i'm in my 40s, and i'm not interested in alcohol-soaked pool parties and "bottle service" at an "ultra lounge." i still care about modest rates and decent gambling when i'm in vegas. downtown is doing a nice job of competing with the strip, for young and old. it will never offer the ridiculousness of the strip, there just isn't enough real estate, but as long as a few downtown casinos remember they're not part of the caesar's empire, it will continue to be a good place to spend your time and dollars, especially if the re-imagining of neonopolis is successful. the quad: another sad chapter in the demise of the strip. Excellent submission. I feel the same way. Plus, who wants to hike for 20 minutes to go to the casino next door?